Following the success of a half-price subsidy for CO2-busting fuel-cell heat and energy generators for homes, Japan is now poised to ship its attention to supplying the UK and Germany with this hi-tech next-generation energy source. With over 5,000 fuel cells providing heat and energy for conventional homes up and down Japan, the BBC has learnt that companies such as electronics giant Panasonic are in talks with EU governments about the possibility of bringing these proven energy and carbon-saving devices to market in Europe and elsewhere. Panasonic has described the interest in its commercial fuel-cell project from the German, Korean and UK governments as "intense", and is confident that Japan, as the first to start commercial sales for homes last year, will be the forerunner in bringing the technology into common use. Fuel cells - a technology that has been around for more than 100 years - convert fuels such as hydrogen and natural gas into electricity through an electrochemical reaction. The resultant heat generated also warms buildings in gas-boiler-sized boxes known as cogeneration fuel cells. The idea is to generate all of the heating and hot water and the majority of the electricity needed by a typical UK home, without the need to be connected to the energy wasteful national grid. Such efficient use of gas supplies can save the consumer around 25% of total energy costs, and reduce each home's CO2 emissions by up to 2.5 tonnes per annum, according to their makers. They also claim customers can earn back the system's relatively high cost, running at present into thousands of pounds, within a few years through utility bill savings. 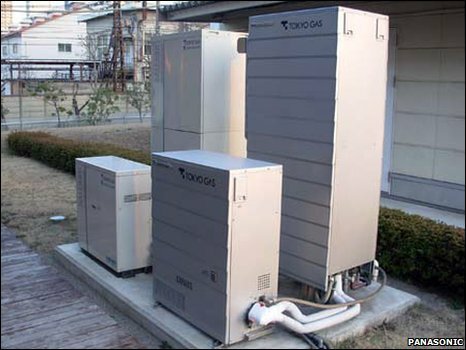 Panasonic and Toshiba, another manufacturer of home-use fuel cells in Japan, sell their cogeneration fuel cells through energy companies such as Tokyo Gas for around 3.1 to 2.2 million yen. Panasonic claims around 3,000 customers so far, including the Japanese PM's office. Half that price is met by the government on each purchase, while other incentives bring the real price down for consumers to about 1 million yen (£7,300). "If the price falls again still, its popularity will gain momentum," general manager of Panasonic's fuel cell project, Mr Yasumasa Kurosaki, told the BBC. He added that the company aimed at fixing the per-unit price at around 500,000 yen, and get it even lower in the near future. With economies of scale, Panasonic says, such devices could be competitively priced at around a couple of thousand of pounds by 2013. "With over 40,000 hours running time already logged, we have proven the safety, reliability and CO2 savings of our devices in the real world while sales are improving gradually. We expect next year's sales to be up 20-30% on the last fiscal year," he said. The UK government has estimated that microgeneration products, such as fuel-cell combined-heat-and-power (CHP) units, have the potential to supply over one-third of the country's total electricity needs and help meet its environmental obligations. However, high capital costs are still a major barrier to widespread adoption of fuel-cell technology. Fuel-cell makers have yet to turn a profit despite the massive investments in Japan and elsewhere around the world. But some are optimistic the gas-burning-without-combustion systems could be the answer to soaring fuel costs and lowering carbon emissions. "Once fuel cells hit the US$5,000 (£3,300) mark, which we imagine will happen in the next 2 years, these units will become as compelling to home owners as energy-saving water-heaters and double-glazing," Tokyo- based entrepreneur and business analyst Terrie Lloyd told the BBC. "It will be hard to ignore a product that might save US$2,500 or more a year on energy bills." The UK government meanwhile recently announced further support for the adoption of the technology with a money-back feed-in-tariff (FIT) for all fuel-cell owners that starts this April. Under the FIT, any household installing a fuel cell will receive a generation payment of 10p/kWh for all electricity generated over a 10-year period, plus an additional export payment of 3p/kWh for any electricity that is not consumed in the home and is fed back into the grid. Importantly, households will still retain the efficiency savings on their energy bills, providing an incentive to consume any electricity generated on-site, in preference to exporting to the grid. "On average, a home fuel user can expect about £360-a-year cash-back in addition to the energy bill savings from consuming the electricity generated on-site," according to the UK's leading fuel-cell maker, Ceres Power. The company plans to go into mass production after completing field studies this year. Initial prices for its generators are not yet available but they are unlikely to match Japanese competiveness, says Mr Lloyd, as Japan has achieved a big start with widespread commercialization last year. Despite high prices, some think the market is ready to explode. Tokyo-based research firm Fuji-Keizai Group has estimated Japan's market for fuel cells will expand nearly 100-fold from fiscal 2009 to 1.61 trillion yen in fiscal 2025 owing to uptake of the technology for housing and vehicles. Fuel-cell systems for housing, says its report, will serve as a driving force for the market until 2018 when fuel-celled cars are expected to take over demand. Panasonic is bullish about possible exports of Japanese know-how to the UK and Germany where gas is generally cheaper than electricity per kW and solar cells offer a poor return on investment. Mr Kurosaki said he was confident Panasonic could reduce costs, increase efficiency and extend the life of its units which now have a lifespan of 10 years to make an attractive package to overseas buyers and governments looking to cut CO2 emissions quickly. With gas fuel for Japan's fuel cells more costly per kW than electricity in Japan, some analysts see Japan's nascent fuel-cell industry reaping benefits abroad. And with such high prices for gas in energy-poor Japan, take up of the new technology may well fizzle out along with the government subsidies that support the current market. Cutting capital costs and boosting sales to compete abroad seems the only likelihood of success for the Japanese makers if they are to scale up and be competitive without subsidies.